There are about 145 million people in the country, 13 towns and cities with more than a million inhabitants - the largest of which are Moscow and St. Petersburg. Eighty per cent of the whole population are ethnic Russians (Slavs). More than a hundred different peoples or ethnic groups speak their own languages, but everybody knows Russian as well. Sixty per cent of Russians are atheists. Most believers are Orthodox Christians. The most widespread Russian surnames are Kuznetsov, Ivanov, Petrov, Smirnov and Popov. First names - Elena and Alexey. There are more women in Russia than men. Russian brides are famous in the whole world not only for their looks but also for their household skills. Many foreigners come to Russia with the special aim of finding beautiful Slav wives and taking them away to their homes. «The Russians harness slowly, but they ride fast». It's interesting to mention that these words, characterizing the Russian style pretty accurately, were said by the prominent German politician Otto von Bismark about one hundred and fifty 7years ago. The Russians are a talented nation. We are proud of our famous fellow-countrymen. 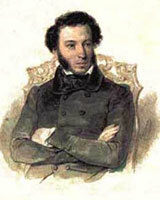 Russia gave the world Tolstoy, Dostoevsky and Chekhov. Five Russian authors - Bunin, Sholokhov, Pasternak, Solzhenitsin and Brodsky - were awarded with the Nobel Prize in literature. Music by Russian composers is played throughout the world -Tschaikovsky, Rachmaninov, Stravinsky, Prokofiev, Shostakovich, Shnitke. Malevich and Kandinsky - representatives of the so-called "Russian avantguard" - became famous for their innovations in painting. Discoveries and achievements by Russian scientists in chemistry, nuclear physics and aviation - they're common knowledge. Some firsts of invention are regarded in Russia in a way different from that generally accepted. For example, foreigners become genuinely surprised when they learn that Russians consider themselves inventors of the first steam locomotive, electric bulb or radio. Nevertheless, there are lots of things where Russian firsts are of no doubt. In 1961, Russia (then the USSR) first sent a man into space. Russian tanks, battle air-craft and famous Kalashnikov tommy-guns are definitely the best in the world, as well as the Russian classical ballet. The names of Anna Pavlova, Galina Ulanova, Maya Plisetskaya, Rudolf Nuriev and Mikhail Baryshnikov are known to each and every educated person. Equally obvious are the achievements of Russia in sports: traditionally high places in team scores at the Olympic Games, world records and titles of our swimmers, weight-lifters, gymnasts, figure-skaters. Among the world champions in chess there are more Russians than all others put together.